Lone Star: A History of Texas and the Texans, T. R. Fehrenbach, Collier Books. 761 pp. I’ve had a fascination with Texas history ever since we moved into the state 15 years ago. Buying this book, which at 761 pages is quite intimidating, helped me really understand the state, its people and its history a great deal better. For instance, it was fascinating to learn that it was the arrival of the Spanish horse into Texas that turned the Comanches from just another starving band of Indians to the unquestioned rulers of the High Plains. The Spanish and the Mexicans could not beat them, and for many decades, the whites couldn’t either. The Comanches stayed unbeatable for at least a hundred years, and it wasn’t until the white men used Comanche fighting techniques that they were able to overcome them. In fact, in 1870 there were fewer people living on the frontier between San Antonio and Fort Worth than there had been 20 years before. Lone Star starts in the Pleistocene Era and spends good time setting up a total understanding of what makes Texas what it is today. He explains about the various Indian tribes, how they were at war with each other constantly, and who settled where and why. He spends time talking about the Spanish and how they continually tried to domesticate the Indians, with little or no success. And after fighting the Comanches and Apaches for a long while, they, and later the Mexicans, generally gave up on colonizing Texas, instead inviting Anglos to live in what they considered a buffer state between them and the Indians. It wasn’t until the whites began to outnumber the Mexicans that trouble began. The spirit of independence and frontierhood that Texas is known from comes from the fact that Texas has a long history of being at war with the Indians or the Mexicans. Some of it was Manifest Destiny; a lot of it was simply that three completely different ways of life couldn’t live in the same general area without two of them eventually being overcome. Texas was growing rapidly when the Civil War came. Eighty percent of men between the ages of 16 and 60 went off the fight for the Confederacy. When they lost the war and returned, they came back to a home state that was run by northerners. Reconstruction laws made it illegal for anyone who had served in the Confederacy to hold a public office. Because of this, the most qualified men could not help the state recover from the war. The book continues on to talk about the cattle, oil, Reconstruction, the Depression of the 1890s, and labor and political battles that went on for decades. It does spend a lot of time on politics in the last few chapters; it also glosses over some historical items that were of interest to me (the hurricane that destroyed Galveston in 1900; the assassination of Kennedy n 1963). I found the first half of the book a lot more interesting than the second half. So, reluctantly, I give Lone Star four stars out of five. 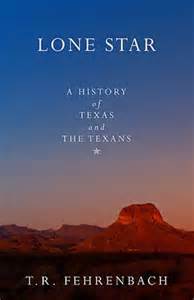 I will say, however, that it would be difficult for anyone to find a more comprehensive, interesting book about the history of Texas.